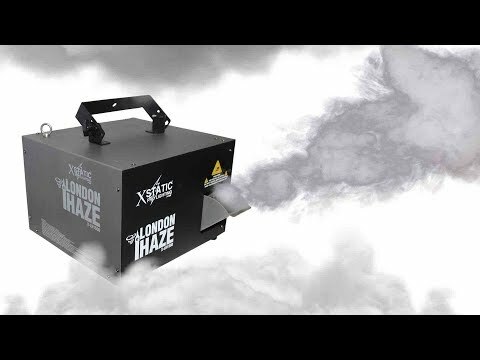 The X-Static X-LH1500 London Haze is a powerful haze machine designed to provide superior and uninterrupted performance in the demanding mobile applications of today. Through the use of the 1,500W heat exchanger, the X-LH1500 produces peak output ideal for both mid and large-sized venues and stages in both install and mobile markets both indoor and outdoor (unit is indoor rated, but can accommodate outdoor venues). This machine uses only water-based haze fluid and can produce a smoke output of up to 20,000 CFM. Another added feature is the included 8 Key RF Remote & Transmitter for easy operation without the need for DMX. The X-Static X-LH1500 has stable continuous output, provides excellent results, and is the best choice to create a laid back, romantic feel. With other products on the market that cost much more, the X-Static X-LH1500 offers the same product with upgraded technology for only 1/3 of the price. Create spectacular special effects and unique entrances for your events with this unique machine, 1 is great, 2 is amazing!